The award winning Krone Comprima series of round balers available from Kubota Tractor Australia has been field tested for two years under harsh Australian conditions. These machines have showed great potential in setting the benchmark for fast forward speeds and increased bale weights in round baling. Contracting business D & K Black from Murchison Victoria has been using a Krone variable round baler with cutter unit (V150XC) in the 2008 harvest season and is really happy with their decision to invest in Krone. “It is the combination of forward speed, bale weight and simplicity that make this machine so interesting. The machine saved us a lot of time last season and we were able to bale anything we put in front of it. The cam less pick up, the drop floor under the cutter and the new slat and belt conveyor system are the stand out features of the new baler” said David Black. The new Comprima round baler introduces a world first semi variable chamber model, the F155, and two variable chamber models, the V150 and V180. The new semi variable chamber model F155, has won numerous prestigious awards around Europe for its innovative new concept. The baler (which is a fixed chamber) can make six different sizes of bales from 1.25m to 1.5m in diameter by a very simple process of just changing two pin locations at the back of the machine – no tools required. Variable machines V150 and V180 produce bale sizes from 0.9m up to 1.5m on the V150 and up to 1.8m on the V180. The Novogrip Press System relies on a combination of fabric belts and horizontal slats to form the bale. It is this combination of belts and slats that comines the benefits of chain-slat systems to the benefits of belt-type systems. The Novogrip system has been implemented both on fixed chamber and variable chamber balers. The Novogrip principle relies on fabric belts that replace the chains used on traditional Krone chain-and-slat systems. Mounted on to these fabric belts, horizontal slats grab the material as soon as it enters the baling chamber, rotating it and forming the bale in the process. The fixed bale chamber is rectangular at the beginning of baling, with the milling effect leading to extremely high pre-compression in this initial phase of baling. As the slats mesh with the material, they positively turn the bale in all types of crop and weather conditions, eliminating any slippage that may lead to the bale stalling and also reducing any shatter losses, as can be observed on other systems. This design effectively minimises the risk of bale stall. Novogrip belts are made of various layers of different fabrics and rubber, which are wrapped to form an endless belt and subsequently vulcanised, the result is belts which are very high strength. They have a rated resistance to tearing that even in the most difficult crop conditions is subjected to only 10 percent of its load rating. This accounts for the 20 percent increase in bale density achieved by the new Comprima range. Further innovative features include the EasyFlow pick-up system featuring no cam track (meaning less wear and a 30% higher input speed), a 17 knife chopping system, net and twine wrapping as well as a new electronic control system. 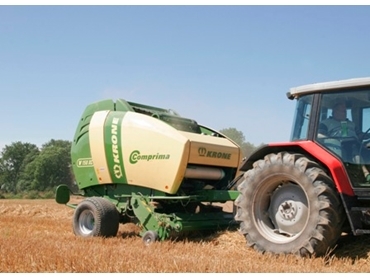 The Comprima range is the first round baler to use the cam track-less EasyFlow Pick-up system. The pick-up gathers the material over a width of 2.15m (DIN) and ensures a continuous flow of crop into the machine. The new optional X-Cut chopping rotor with 17 knives cuts the material as it enters the machine to form bales that are easier to feed or bed out later. The nominal chop length is 64mm. In case the machine is blocked, the drop floor that comes with the cutter machines is hydraulically lowered from the tractor seat to clear the blockage. Comprima balers are available with either a net or double twine wrapping system that comprises an active net feed system. At the end of the baling cycle, net wrapping is triggered by an electric motor, which actuates a rocker arm to feed the net over a guide into the bale chamber. The number of net wraps is sensor controlled and once the programmed number of wraps has been completed, the net is cut automatically. Tthe new Comprima range incorporates a number of innovations as demonstrated by the fact that as many as eleven patents have already been granted to Comprima. Because of the popularity of these machines in Europe, Kubota Tractor Australia has only limited supply for the 2009 harvest season.